"All the years sitting on backhoes and excavators, I knew there had to be a better way." Bill Hall invented "a better way" back in 1998 when he patent a time-saving blade, now known as GRADEBLADE. 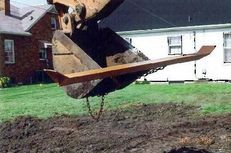 In just 60 seconds contractors can slide a GRADEBLADE over their toothed bucket and prevent cut-sod or teeth marks in customers' yards. 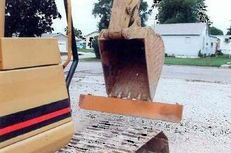 "All of us contractors have made something for ourselves...," and with 30 years experience Hall found a way to turn a toothed bucket into a smooth wide edge with wings. These amazing blades are not only lightweight and inexpensive, but they save contractors time and money. An Iowa native, Hall owned and operated "Hall’s Construction & Excavating" until his son took over the business, leaving Hall time to focus on his invention. In the first year alone, Hall sold 20-25 blades in his local area. Before GRADEBLADE, Hall admits he knew nothing about patents or about business marketing. Today, Hall’s GRADEBLADE has been sold in every state in the nation, all providence's of Canada, a few countries overseas and has been in 13 national magazines. GRADEBLADE is a company whose sole purpose is to help contractors increase productivity while saving them time and money. 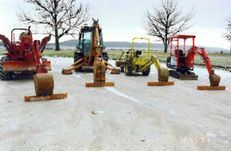 Bill Hall, Creator and President of GRADEBLADE, has made a product that is inexpensive, convenient and will fit any brand, type or size of machinery. In just 60 seconds GRADEBLADES’ Crumbing and Squeegee Blades will slide over the teeth of your bucket; always bringing material towards you. GRADEBLADE guarantees their blades will reduce backfill time, leave no teeth marks and eliminate the need to rake, shovel, spread sand or run a compactor. All GRADEBLADE blades are 100% American Made and 100% steel. Call 319-470-3033 for more information or to place an order. Phone is always answered 7 days a week from 7am to 10pm.